So when you realize I'm going to be gone and in danger, don't let it shake you. It's God playing hide and seek with you; all you have to do is stop crying and look up and there He is, as he was for Mary Magdalen in the garden of Easter. "It gave me a different idea of being a soldier." That is what a young man going into the Marines told me when he saw these letters. That is what I wanted to hear, to know whether Roy's letters contained what I thought: a voice that says: Soldiers are called to greatness and even to holiness. There is a way of talking about war which can seem to suggest that a soldier cannot be responding to the call to holiness. This leaves Christian soldiers in a certain degree of spiritual abandonment. It is hard enough to face all the privations and difficulties of war with a pure heart; believing in the highest reach of their vocation can seem unreal. Anyway, what would we do about it? Michele, Roy's wife, clearly believed in him and upheld his spirit, day by day. Military sisters, brothers, parents, friends, and especially military wives have their own hearts to offer. "...Usually at Christmas time, there isn't enough time to think about what we're celebrating; out there, there wasn't much else to do. The story of God taking on human misery out of pity and love and the story of Our Savior coming... I don't know. I think perhaps Christmas is for the miserable. Anyhow, I felt it belonged to us..."
They are a mixture of hope, tenderness, friendship, beauty, childlikeness, love; at the same time, they speak of unfairness, dismay, and then anger about all the things that have troubled generations about war in general and that war in particular: the sorrow and loss, the waste, the quarreling, the betrayed sense of purpose. They are also about prayer and about the power and the difficulties of prayer and the challenge and value of acceptance of God’s will. Indeed, they reveal a soldier with a great soul. Preparing them for publication sometimes made me so sad, I could not stop weeping. Other times, I was so angry, I had to stop and pray for acceptance all over again. But in the end, his words just needed to be shared. Yes, we would like no war. But meantime, war is here, and we need our soldiers to know that they are not abandoned by God, but are loved by Him and called to holiness, just like everyone else. This book is the best way I can think of to say that. 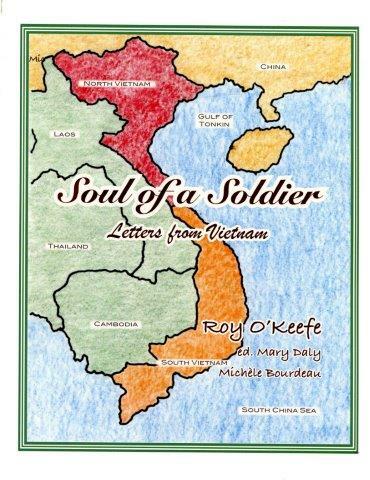 Besides the letters, you will find a short bio and some photos of Roy, of Vietnam, and of the people and countryside around him. His wife shares a brief reflection on the kind of person he was. His sister offers a few pages on the war itself, not wanting the history lesson to overtake a very personal document, but knowing that for the rising generation, this war is already distant history: what was it about? Why was it so divisive? This volume is not presently being offered through other distributors; it is a small printing, in color and on acid-free paper. There are about 50 letters, all different lengths, a few poems, some pictures.